Did you know? There is a region in Iceland that is like its miniature version. Snaefellsnes peninsula gives travellers a gist of everything that you will find across the entire country. The term is quite a mouthful for travellers to pronounce but it translates to ‘Snow Mount’s Peninsula’ which is quite an accurate name as it is a long peninsula with a volcano crowned with a glacier. It is a rather small region including a piece of land with so many wondrous attractions. There is so much variety in just this one peninsular with a volcano, a glacier, lava fields, craters, waterfalls, black and white beaches, caves, picturesque mountains, calm fishing hamlets, villages and towns along with mesmerizing views of the coastline. If you are accommodated in Reykjavik, it can be a one-day trip in the summertime to catch a glimpse of all the attractions. However, if you want to extend your trip, you can pace yourself and admire all that this stunning peninsula has to offer. The Snaefellsnes peninsula leaves no room for boredom as there is just so much to see. 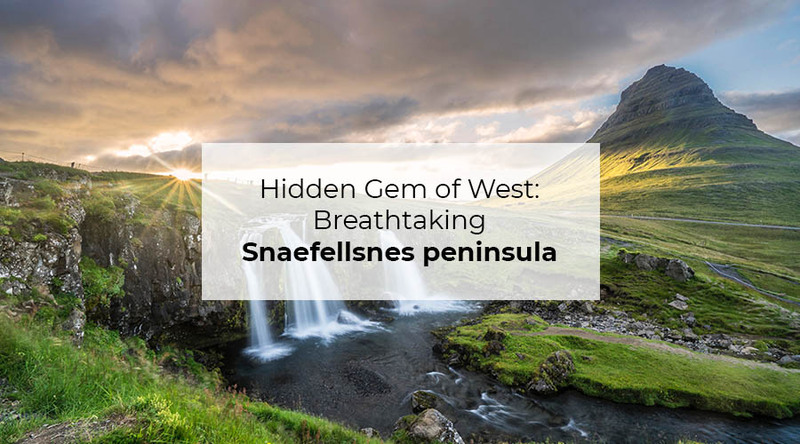 In this blog, we will be highlighting the topmost attractions that you just cannot afford to miss at Snaefellsnes peninsula. It offers diverse landscapes that include sparkling fjords, sea cliffs, a glacier, sweeping beaches and beautiful mountain scenery, to name a few. #1 Hraunfossar and Barnafoss waterfalls: Kickstart your journey from Reykjavik to your first stop, a 2 for 1 waterfall area. You’ll hear the sound of water at a distance. When you reach the viewing platform, your first look will be the gorgeous Hraunfossar which translates to “Lava waterfalls”. It is a wide stretch of water cascading over lava that is covered with mass. The waterfalls down to a pool of bright turquoise water! Once you’re done admiring this magnificent beauty, take the right towards Barnafoss through a well-marked path. You will reach a bridge crossing a river. Barnafoss translates to “Children´s waterfall”. The rocks rest close to each other in harmony forming the most fantastic views. #2 Ytri Tunga Seal Beach: Next, head straight to the Ytri Tunga Seal Beach and say hello to some curious and fascinated seals on the seal beach. The sandy beaches act as a refuge for grey and brown seals that sit around the large rocks scattered across the beach. While you’ll find them year round, but the months of June and July holds more chances of you spotting these mammals soaking the sun rays. #3 Kirkjufellsfoss: Your following stop is yet another waterfall with a unique charm of its own. Kirkjufellsfoss waterfall is found in the Kirkjufellsa river near Kirkjufell at the northern side of Snaefellsnes peninsula. This is a gorgeous little waterfall around five meters tall, flowing in a few levels, split into three spouts. You will view the pyramid-shaped mount Kirkjufell towering above the waterfalls. It is considered to be one of the best views that Iceland has to offer and an absolute paradise for photographers. The clear water paired with the mount behind is stunning during summer with the light of the midnight sun. If you’re heading there during winter, you might find the sky coloured with the Northern Lights, a sight to behold, indeed! #4 Hellnar and Búðakirkja Black Church: After what we describe to be a magical experience, stop by this little village of Hellnar where most of the fishing population resides. The stunning Búðakirkja Black Church is a perfect sight for those who want to sit and simply enjoy the surroundings. If you’re in the mood to do something adventurous, hike along the beach towards the Arnarstapi village. #5 Bárður Snæfellsás: End the tour with a visit to the huge statue of Bárður Snæfellsás. It is unique due to the half human and half troll appearance who is also considered to be the protector of the land as per Icelandic myths. He was extraordinary. His mother was the most beautiful and the tallest in her time and his father was half-giant and half-troll. As a result, Bárður was very handsome. The Snæfellsnes Peninsula can be a great destination throughout the year. While Iceland tunes off for the most part during winter, this gorgeous peninsula is still open with decent roads. In addition, the view of the journey is even more enticing when it is all covered in snow. With Sterna Travel, you can explore this gorgeous stretch of land with a two-day fully guided tour, covering all the fascinating attractions and much more! Sterna offers an excellent tour with English-speaking guides who are friendly and will tell you everything about the peninsula, its myths and other enticing stories. So, what’s the hold-up? Pack your bags and begin your adventure to miniature Iceland with Sterna Travel’s Snæfellsnes peninsula tour.